Usually in the form of a product demonstration, sometimes starting with a two minute "Elevator Pitch". The vast majority of time I have considered incumbent upon my obligations to this professional network to listen, watch, take notes, try it out, talk to any dealers currently using the widget in question and generally become aware of what it is, what it costs and what the claimed Return On Investment (ROI) is all about... The how when and why of ROI. More background and qualifications; For over 30 years I have been blessed with work and assignments that required me to (in addition to selling cars) create product and solution development "Road Maps" used to guide future products and when they would be released for companies such as American Honda Motor Company, Reynolds, ADP (CDK), JD Power, BMW North America, Tier10 Marketing, Ford Motor Company, Toyota Motor Sales, Mercedes-Benz USA and a few more. These projects resulted in me spending countless hours with software developers, project planners and executive committees as we defined what car dealers would need to stay competitive and to improve what customers experience when dealing with them. As a result of this exposure, combined with my experience in selling cars while managing car dealerships, solution development and professional services to car dealers while working at the Reynolds and Reynolds Company, ADP Dealer Services (CDK Global), Tier10 Marketing, Courtesy Chevrolet and many other dealerships... I have developed a strong sense of which products and services do what, how well they do it, and whether or not they are worthy of consideration by car dealers, auto groups and enterprise organizations. You may be thinking "Everybody has an opinion", and you are correct... However, my opinion comes from an auto industry veteran with Bachelor of Science and Masters Degrees in Business Administration, who has implemented software and business procedures in car dealers that I served as a manager, as well as being employed by the largest software development companies in the car business to serve as Practice Leader and manager of consultants deployed to assist car dealers in the implementation of technology, people and process designed to drive improved business results and customer experience. I know what I am talking about when it comes to deploying solutions in car dealerships and I am eager to share my experience, insights and wisdom on the use of existing solutions and those to come in the future. Several weeks ago I was approached by a couple of automotive professionals who I consider to be "Thought Leaders" within our industry... 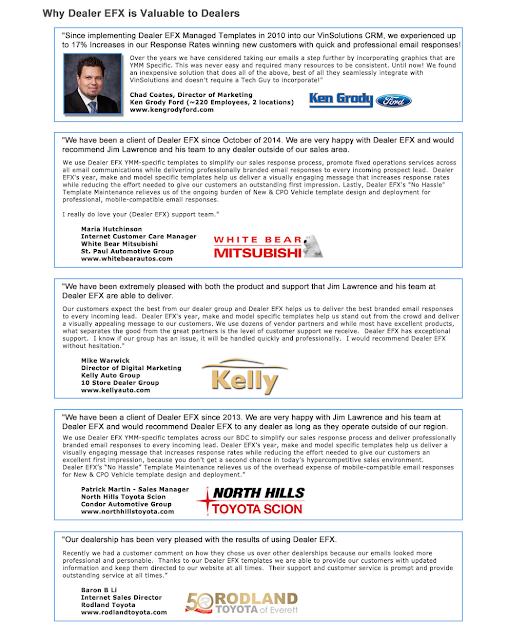 They asked me to consider creating and publishing a weekly newsletter with insights, opinions, guidance, reviews and recommendations for car dealers focused on products and services, along with sharing best practices and what I see as future developments, strategies and tactics in the car business. My initial response was to say I am already doing this with the ADM Professional Community website and network. These people, who I consider to be wiser and possibly more intelligent than me, responded with, "Maybe so, but you currently provide your members with something that they must go to your site to find and see..." Which I acknowledged was true. They went on to say, "We want to create a newsletter that is delivered to members of the ADM Professional Community and additional professionals who are not members, but who work in the auto industry, which will become a valuable resource throughout the car business..."
I agreed and so the genesis of the "Ralph Recommends..." eNewsletter has come to be. Within the next couple of weeks you will be sent the first issue of "Ralph Recommends..." and I would like to ask for your help. Please take a look at what is in there and let me know your opinions about what's good, what's bad and what you would like to see. You can send me an email to RPaglia at Gmail dot com, a message via this network, Facebook Messenger, Twitter DM, call or text me on my cell at Five Zero Five, Three Zero One, Six Three Six Nine, or contact me in whatever manner suits you... But any feedback will be appreciated and considered as I move forward with the "Ralph Recommends..." project.